Sgt. Tony Wood, left, and Spc. Joseph Gentile are among the 191 soldiers assigned to the Warrior Transition Unit at Schofield Barracks, which was created last year following disclosures that the Army wasn't being responsive to the needs of veterans wounded in Iraq and Afghanistan. Forty-five minutes after Spc. Joseph Gentile was injured by a roadside bomb in Kirkuk, his parents in Ohio were notified of his condition by the 25th Division's 27th Wolfhounds Regiment. Three days later, the Army flew his parents and two brothers from Cleveland to a hospital in Germany to be by his side while he recuperated. "They liked that throughout my ordeal, they were kept in the loop," said Gentile, 21, who had deployed to Iraq in the summer of 2007 as a member of the 25th Division's 3rd Brigade Combat Team. Today, after being in a wheelchair for three months, Gentile is walking again and is one of 191 soldiers assigned to Schofield Barracks Warriors in Transition Unit. More than 29,000 servicemembers have been wounded in action in Iraq and Afghanistan over the past six years, according to Pentagon figures, compared with fewer than 500 during the 1991 Desert Storm campaigns. Much of the care and attention Gentile and his family have received could in part be attributed to the criticism the Army received early last year that resulted in the development of a new medical action plan and the creation of Warrior Transition Units. The Warrior Transition Office was established June 15, after the Washington Post revealed substandard patient care for Iraq and Afghanistan war veterans at Walter Reed Army Medical Center. The newspaper detailed deficiencies including a confusing disability evaluation system and servicemembers in outpatient status for months and sometimes a year without a clear understanding about their plan of medical care. Three months after these Warrior Transition Units were established at Army bases, the Government Accountability Office reported the units, including the one at Tripler, had significant shortfalls in critical positions. However, Mindy Anderson, Tripler spokeswoman, said the GAO report was based on a projected patient load of 200 and not its current load of 191. "Our current staff exceeds the staffing ratio of one squad leader to every 12 warriors; one case manager to every 18 warriors; and one primary care manager to every 200 warriors with 24 squad leaders; two supervisory case managers and 14 case managers; and one primary care manager currently, with another to begin Feb. 3 in anticipation of our numbers exceeding 200," she said. Command Sgt. Maj. David Vreeland, the highest ranking enlisted soldier assigned to Tripler Army Medical Center's Troop Command, said Gentile could have requested assignment to any of the transition units in the Army after completing two months of hospitalization at Tripler. The Army said there are 35 transition units taking care of 9,000 wounded and injured warriors. Ninety-nine active-duty soldiers, Army National Guard, Army Reserve and civilians are assigned to the Schofield Barracks transition unit. Each of the 12 squad leaders in the warrior transition unit is assigned 12 soldiers who either were wounded in combat or injured in training, Vreeland said. "All of these soldiers no longer can do their primary duty and we take them in until they are healed." Besides a squad leader, each wounded or injured soldier is also assigned a primary care manager, usually a physician, and a nurse case manager. These three check on their assigned soldiers until they return to their units or transfer to the Department of Veterans if they leave the Army. Brig. Gen. Steve Jones, who commands Tripler Army Medical Center, said the average stay for soldiers assigned to these transitional units is six months. In the case of Army National Guard and Army Reserve soldiers, Vreeland said the Army tries "to get them as fit as they were before mobilization." 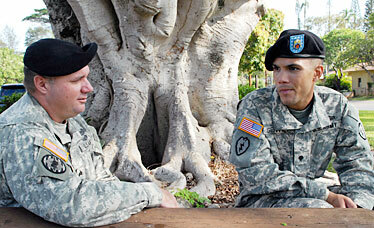 The level of care a soldier receives in the transition units depends "on his involvement with those in charge," said Sgt. Tony Wood, who lives with his family in Ahuimanu. "If you have a problem and it isn't fixed, it's because you haven't let somebody know what it is." Wood is unable to continue his career in the Army as a military police officer because he is suffering from a traumatic brain injury following a roadside bomb attack in Iraq three years ago. On July 27, 2005, as Wood was returning from a mission near the Iranian border, his Humvee was struck by three improvised explosive devices, with the first one being a penetrator type and the other two shrapnel types. "The blast immediately killed my driver and gunner," Wood recalled. "You couldn't find any traces of them and they were sitting just inches from me. I remember seeing the door on the driver's side just flapping in the wind, yet there was no one in the vehicle. I didn't see or hear or feel the blast. "The Humvee had crashed into the median, setting off two frag grenades that we carried inside the truck with me still in it," Wood said. He was in a coma for 45 days. Recently, Wood was cleared by an Army medical board and will be allowed to remain in the service. He hopes to start a career as military police instructor or an investigator. Gentile had been in the Army for only 18 months when he was injured June 20 while driving the lead vehicle in a four-truck convoy. Two 130-mm mortars "tore off the whole front end of my Humvee," Gentile said. Gentile still has a foot cast and he now has to put aside his dream of attending flight school and flying helicopters. His leg injuries prevent him from remaining in the infantry, but he wants to remain in the Army. While confined to a wheelchair, Gentile volunteered to work for Tripler's public affairs office, moving throughout the hospital taking pictures. » Identifying patients before they arrived at Tripler and tracking them until they left the hospital. » Assigning a case manager to a soldier before he or she arrives and who remains assigned to the patient until he or she leaves. » Establishing a deployment health center at Tripler to support all the needs of the deploying soldier and his or her family. » Establishing a deployment health clinic for wounded and injured soldiers, and a family assistance center at Schofield Barracks.